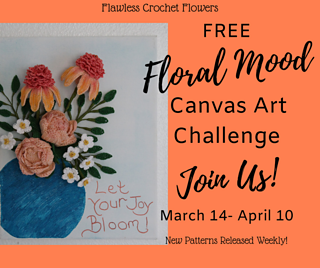 Welcome to our Floral Mood Canvas Art Challenge! This challenge will last for 4 short weeks beginning March 14- April 10. The purpose of this challenge is to create a floral canvas art that carries a specific mood for your environment that you’ll create using colors. Please note that there is a FREE version of this challenge on my website that you can find HERE. However, the patterns on my website will be availble during the time of the challenge. If you’d like to have all 4 patterns in your Raverlry library for later use, grabbing the the step by step downloadable versions will your best bet. Patterns will be added as they are released each week.